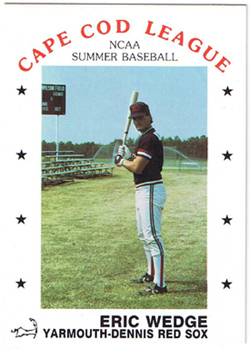 The 1988 Cape Cod Baseball League season began as any other. By early June, the fields had been groomed and were ready for play, housing and employment arrangements for most of the players had been worked out, and many of the country’s best college players began arriving, eager to show their skills on Cape Cod. The games began, as always, in mid-June as crowds flocked to the fields to see their hometown teams in action. Major League scouts began arriving in July to evaluate prospects destined to sign professional contracts. The 1988 All-Star Game was played at Eldridge Park, home of the Orleans Cardinals, with the West Division beating the East Division, 4-3. The winning pitcher was Falmouth’s George Tsamis. The regular season soon ended with the Wareham Gatemen winning the West Division with a 29-13-2 record, then sweeping the runner-up Hyannis Mets in the divisional playoffs. The East Division was won by Yarmouth-Dennis, but the Red Sox were ousted in the divisional playoffs by Orleans, which had finished in second place with a 22-20-2 record. Wareham prevailed in the finals, defeating Orleans two games to one to capture the Cape League championship. The league’s Most Valuable Player was Brewster first baseman David Staton, who hit 16 home runs to tie Tim Teufel (1979) for second place for the single-season home run record (Corey Snyder has the record, hitting 22 in 1983 for Harwich). Wareham’s John Thoden, who posted a 9-1 record with an impressive 2.43 ERA, won the Outstanding Pitcher Award. The league’s Outstand Pro Prospect and Batting Champion was Wareham shortstop Chuck Knoblauch, who hit .361. The season was over by mid-August, and the players returned to their colleges. Some signed professional baseball contracts. 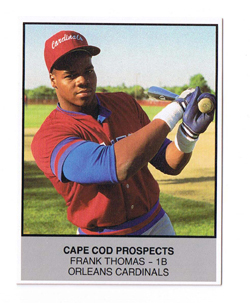 The Cape Cod Baseball League had successfully completed another season, but just how special that 1988 season was wouldn’t be realized until years later when players from that year began showing up on major league rosters. We now know that 1988, the “cream of the crop” year, produced an incredible total of 40 major leaguers whose combined overall success is simply staggering. Equally impressive is that 15 of those 40 players lasted 10 years or longer in the major leagues and three were still active as the 2008 season got under way -- Frank Thomas (Oakland), Jeff Kent (L.A. Dodgers) and Mike Myers (L.A. Dodgers). Five players knocked out at least 300 homers and at least three of the players have a legitimate shot at someday being enshrined in the National Baseball Hall of Fame in Cooperstown, N.Y. 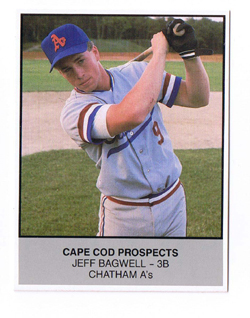 Among the better known names of 1988 Cape Leaguers who went on to outstanding major league careers are Thomas, Kent, Myers, Knoblauch, Jeff Bagwell, Tim Salmon, Jeromy Burnitz, Mo Vaughn, Denny Neagle and J.T. Snow. Three won Rookie of the Year awards (Bagwell, 1991 NL; Knoblauch, 1991 AL, and Salmon, 1993 AL). The group produced five Most Valuable Player awards (Thomas, 1993 & 1994 AL; Bagwell, 1994 NL; Vaughn, 1995 AL, and Kent, 2000 NL). The 300-home run club includes Bagwell, 449; Burnitz, 315; Kent, 365; Thomas, 513, and Vaughn, 328. Other notable achievements were by Snow, who won six Gold Gloves; Neagle, who won 124 games over a 13-year career; Knoblauch, who stole 407 bases and played on four world championship winners, and Burnitz, who drove in 100 or more runs four times. Myers extended his career by developing a sidearm delivery and becoming a left-handed relief specialist. Entering 2008, he had pitched in 883 major league games. As for the future Hall of Fame candidates, they have put up numbers that make each of them each a virtual lock for the honor. Bagwell, who played his entire 15-year career with the Houston Astros, was a model of offensive consistency. He drove in 100 or more runs eight times, hit 30 or more homers nine times, drew 100 or more walks seven times and scored 100-plus runs nine times -- all this while hitting 449 homers, stealing 202 bases, twice being a member of the 30/30 club, and accumulating a lifetime on-base percentage of .408. Bagwell amassed these numbers despite playing his first nine years in the pitcher-friendly Houston Astrodome. Kent, still active with the Dodgers, has also put up very impressive statistics since his first big league season in 1992. He has played in five All-Star Games, driven in 100-plus runs eight times and hit 20 or more homers 12 times. Kent has hit more home runs than any other second baseman in the history of the game and is fourth all-time in doubles. His 948 extra0base hits put him only 52 away from the 1,000 mark – a feat accomplished by only 28 players in major league history. Thomas, who joined the 500-homer club in 2007 with the Toronto Blue Jays and is now with the Oakland A’s, appears to have a few hits left in his bat. Although injuries have limited him to the role of designated hitter, his appearance in the lineup causes problems for opposing pitchers. Since his rookie season in 1990, the “Big Hurt” has hit 30 or more home runs nine times, driven in 100-plus runs 11 times, scored 100 or more runs nine times and drawn 100-plus walks 10 times. His lifetime on- base percentage is .421. In 2007, he joined the select few who have 1,000 or more extra-base hits, and he ended the 2007 season in 26th place on the all-time extra-base hit list with 1,012 and in 18th place on the all-time home run list with 513. Another chapter to this story is still to be written. Eric Wedge, who played for Yarmouth-Dennis in 1988, is now the manager of the Cleveland Indians and is regarded as an up-and-coming manager. He was named American League Manager of the Year after guiding Cleveland to the American League Central Division title in 2007 with a 96-66 record. Yes, the class of 1988 was indeed an impressive one. 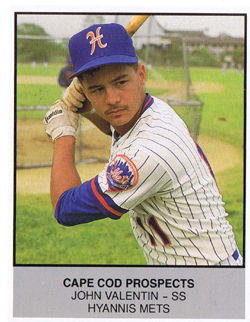 But the remarkable thing about the Cape Cod Baseball League is that each and every year there’s a good chance that another crop of players may match or even surpass the achievements of that remarkable 1988 group. Some believe the class of 2007 had the talent to do just that, and they support their argument by pointing to the fact that 14 of the 30 players selected in the June 2008 amateur entry draft were CCBL products. Each night during the Cape League season fans turn out to watch the best college players of today who may become the major league stars of tomorrow.